A great spiritual writer, Father Lallemant, makes mention in his classic work, The Spiritual Doctrine, a crucial consideration. He says : do not “shorten the time allotted to the thanksgiving [after communion], which, well made, may repair much that is defective in our penances” (p.88). In other words, the time we spend in union with Jesus after receiving Holy Communion, thanking Him for such a great gift, uniting ourselves to His Infinite Goodness, can truly rectify things that may be lacking in our spiritual progress. References: The two quotes at the top of this note are from the Wikipedia article on “Thanksgiving after Communion,” which is quite beneficial. Thank you for your exhortation to thank the Father and to thank the Son for the gift of Jesus coming to dwell in our hearts. I came to this web page to see if your article had suggestions on how to make a better thanksgiving after communion. What do you think of writing an article on that subject? 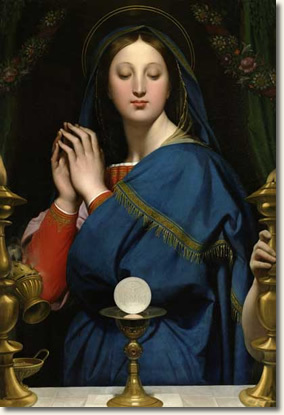 Perhaps many readers have experience with Eucharistic Adoration. We can take what we learned there and apply it to adoration of Jesus living inside us after Holy Communion. Perhaps all of us have had trouble with distractions in our prayer as we come to receive communion. What has helped me the most in preparation is reminding myself as I am traveling to church that I am “going to a wedding, my wedding to Jesus”. That’s what helps me to appreciate the magnitude of the commitment of Jesus giving Himself to me in communion, or to appreciate that “It cost Jesus every drop of His blood” to give me this opportunity to receive Him. When I come forward to receive communion, this helps me to discern the bridegroom, as would be natural for a bride coming forward at her wedding.